For Yogi Adityanath, the firebrand MP of BJP, who is widely known for his controversial statements as well as acts and who every other day asks dissenters to ‘go to Pakistan’ , it was his comeuppance moment when he was rather forced to ‘go back’ to Gorakhpur. 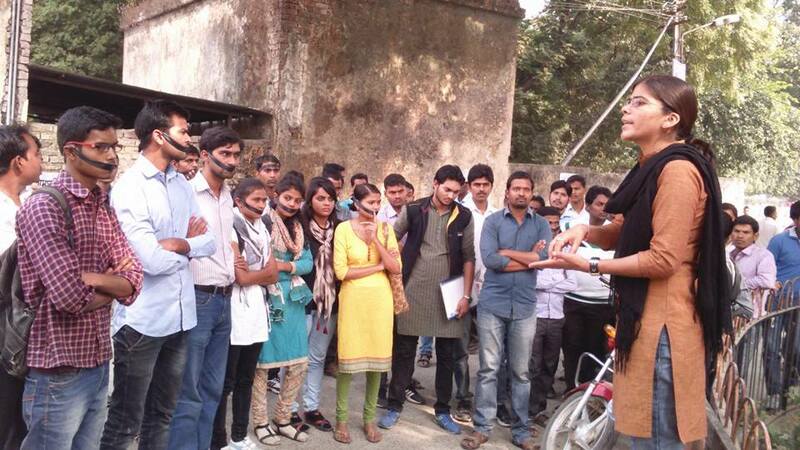 And all his plans to be the star speaker at the inaugural function of Students Union of Allahabad University – once called ‘Oxford of the East’ – lay shattered. The only ‘hindrance’ to their well thought out plan was the President of the Union – a student leader named Richa Singh, the first female President in the 128 year old history of the University – who had won on an independent platform duly supported by various left and democratic forces. The university rules mandated that without the consent of the President no such inauguration of the students union can take place and she resisted their proposal to invite Yogi. Her simple proposal – ‘An Appeal to Students’ – which received wide publicity made a point that instead of inviting a ‘controversial’ person like Yogi which would vitiate the atmosphere further and would impact the composite heritage of the region in negative ways and would further push back struggles for student rights it is better to invite someone – like President of India, Chief Justice, renowned educationist, scientist or literary figure – who would inspire the whole student community. As expected the rest of the office bearers of the Union did not agree to it and with due help from a compliant University administration (see the postscript for further details)- which is running without a proper vice chancellor for some time – managed to get an official declaration that Yogi Adityanath would come to inaugurate the Students Union on 20th November. Infuriated by this unilateral decision of the University administration – which clearly violated the Constitution of the Institution – a campaign was launched in the university and the city to stop Yogi from reaching Allahabad and inaugurate the Union. It was interesting that it received support from different sections of society, not only rest of the political parties – except ofcourse BJP – issued statements and came out in support but lawyers, teachers, trade unions and other sections of the civil society also came forward to oppose this invite. 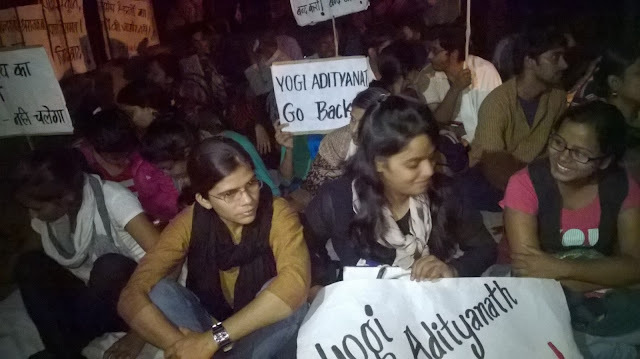 Looking at the fact that the university administration was adamant about its unilateral decision, Richa along with her other comrades launched an indefinite hunger strike in University campus. Hundreds of students and like minded teachers joined the Dharna (sit in) and raised voice of solidarity. In a pre-planned move the sit-in came under attack in the night of 18 th November where saffron goons allegedly led by one of the office bearers attacked them, Richa and other comrades were badly thrashed, vulgar slogans were raised against the girl students and the attackers even did not spare some senior teachers and civil society activists like Padma Singh who had joined the sit-in. The most disturbing part of the whole episode was that the police remained a mute spectator of this attack. This attack raised such a furore that the district administration decided to bar Yogi from entering the city and sent him the order ‘requesting’ him to comply with the decision. As expected the members of the Saffron Parivar tried to raise lot of hue and cry over this decision but they could not do anything about it. Yogi Adityanath, the ‘Lion of Purvanchal’ – in the eyes of the Saffron Parivar – stood tamed, at least for the moment. Spirited resistance by students once again demonstrated the oft repeated slogan ‘ Students United Shall Always Be Victorious’.